During the monsoon season, heavy rain can lead to flash floods. Here are some tips to help you negotiate a flooded road. During a heavy downpour, monitor the radio for weather- and flood-related information. Avoid roads that are reported to be flooded — even after the rain has stopped, as the water takes time to subside. Plan your route to avoid all roads reported to be flooded. While this may increase your commute time, it’s better than dealing with engine failure and the cost of hiring a tow truck and subsequent repairs. HOW CAN I TELL WHETHER IT’S SAFE TO DRIVE THROUGH A FLOOD? When approaching a flooded area, turn back if you can. 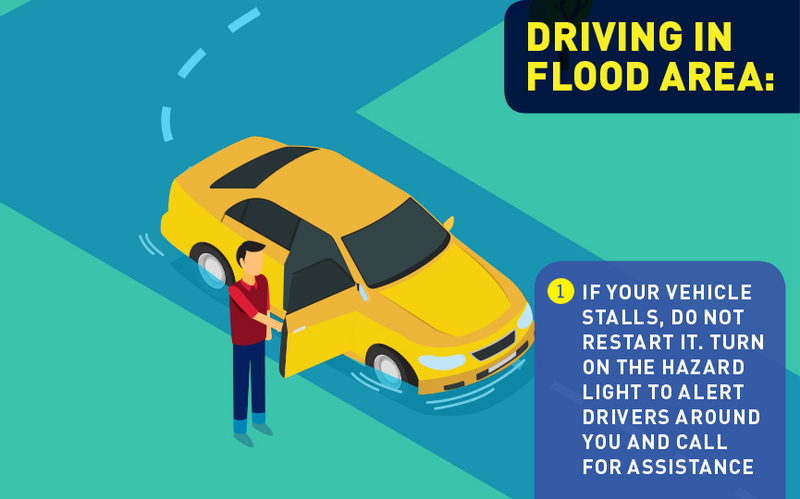 Be especially cautious when driving at night, when it’s harder to recognise and assess the flood dangers. When in doubt, do not proceed. Assess the depth of the flood. If you can’t see a clear way out of the flooded section, or if you can’t tell how deep the water is, then don’t proceed. Avoid driving through floods deeper than 15cm. That depth of still water can stall most cars, and possibly damage the engine and electronics. At depths of 30cm, a typical car can begin to float, meaning loss of traction and, thus, steering control. 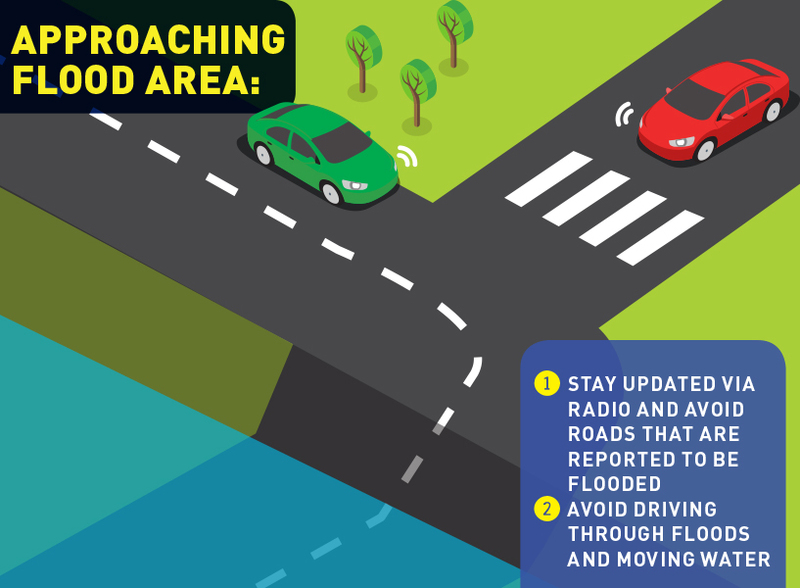 If the flood water is moving, avoid driving through it when it is deeper than around 10cm — if you do, you are likely to lose grip of the road and get dragged into deeper, more dangerous waters. WHAT SHOULD I TAKE NOTE OF WHEN DRIVING ON A FLOODED ROAD? If the flood level is at a safe height, drive on with care. Where possible, flooded roads are best negotiated one vehicle at a time. Allow all oncoming traffic as well as vehicles going in the same direction to pass so as to avoid having to stop in the middle of the flood. Drive very slowly and steadily in low gear to keep your engine speed relatively high and constant until you are out of the water. This ensures that water doesn’t enter through the exhaust pipe and shoot up into the engine bay, which will damage the electronics. Driving very slowly also means less risk of aquaplaning and loss of steering control. If you drive too fast and lose control, hold the steering lightly and gently ease off the accelerator until your speed reduces, allowing your tyres to regain grip. Be wary of hidden potholes. If you are driving slowly enough, these should have little impact. The cambers (edges) of the road will usually have the deepest holes, so stay in the middle of the your side of the road. 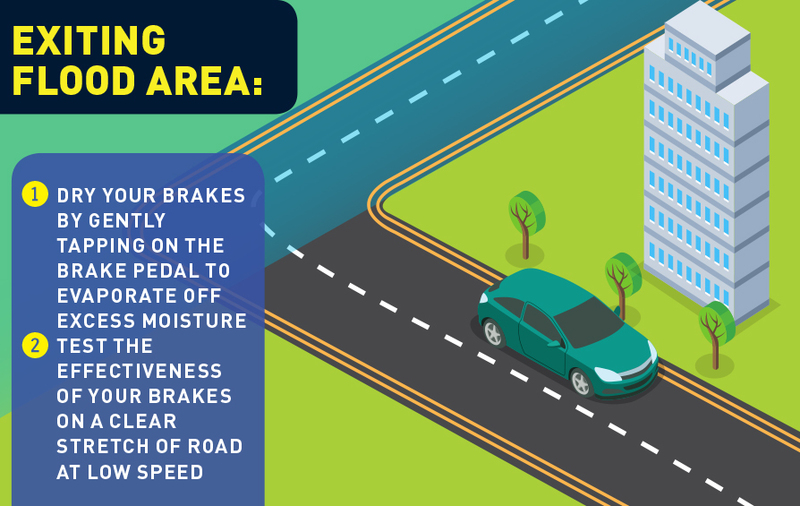 After exiting the flooded area, dry your brakes by gently tapping on your brake pedal to create friction and heat to evaporate excess moisture. Test your brakes’ effectiveness on a clear stretch of road at low speed before you start driving normally again. IN WHAT SITUATIONS WILL THE CAR STALL? When driving through a flooded area at low speeds (between 5 and 20km/h), most vehicles will create a bow wave in its front as it displaces water around it, thereby creating a depression of water in front and underneath your vehicle, preventing water from entering the engine bay. Driving too fast may cause water to splash into the engine bay, stalling the car. Stopping your vehicle eliminates the bow wave, thus leading to water entering your vehicle engine bay, stalling the car. WHAT SHOULD I DO IF MY CAR STALLS? Do not attempt to restart it, as engine damage may occur. 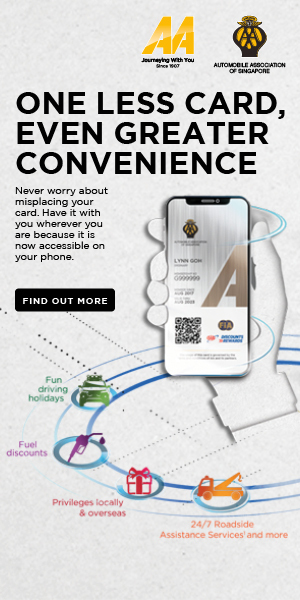 Make sure that the car bonnet stays closed; otherwise, you may have hard time restarting the engine because of the rain-soaked electronics. Turn on the hazard lights to alert other drivers around you, and call for assistance. WHEN SHOULD I LEAVE MY STALLED CAR? If the car has stalled and the water level reaches the bottom edge of the car door, leave the vehicle and move to higher ground — make sure to look out for traffic around you when you do so. Do not wait until your car gets submerged; otherwise, your doors may not open, which will trap you inside. Note that moving water at a depth of 15cm can make it unstable for an adult to walk. After leaving the car, call for a tow truck immediately to avoid causing congestion on the roads.